IP Address is basically your phone’s address. It is used for the purpose of communication between two devices connected to a network. There are four types of IP Address – Public IP Address, Private IP Address, Dynamic IP Address and Static IP Address. The Public IP Address, also known as Global IP Address, is the one that is used to communicate with the internet. On the other hand, a private IP address, also known as local IP Address, is used to communicate with devices in your home or office network. As far as the Dynamic IP Address is concerned, if an IP address is assigned by a DHCP server then it’s called a dynamic IP address. Otherwise, it is a static IP address. Both Public and Private IP Address can be dynamic or static. You might come across a number of situations where you need to know the IP Address of your smartphone. In case you are in such a situation then read on find out how to find the IP Address of your phone. How To Find The IP Address Of My Phone? There are two IP addresses of your smartphone which you might be interested in. Public IP address or the Private IP address. How To Find The Public IP Address Of My Phone? Finding the public IP address of your phone is a piece of a cake. You don’t need to dive into your device’s Settings. Rather, all it takes is a simple Google Search. Open the Google App or visit google.com on your browser and in the search box type “What’s my IP Address?“. And that’s it. You can now see your Public IP Address. This works not only with Google but other search engines like Bing and DuckDuckGo can also tell you your Public IP Address just by a simple search. How To Find The Private IP Address Of My Phone? 1. How To Find The Private IP Address of My Android Phone? There are two ways to know the private IP Address on your Android smartphone. 1. 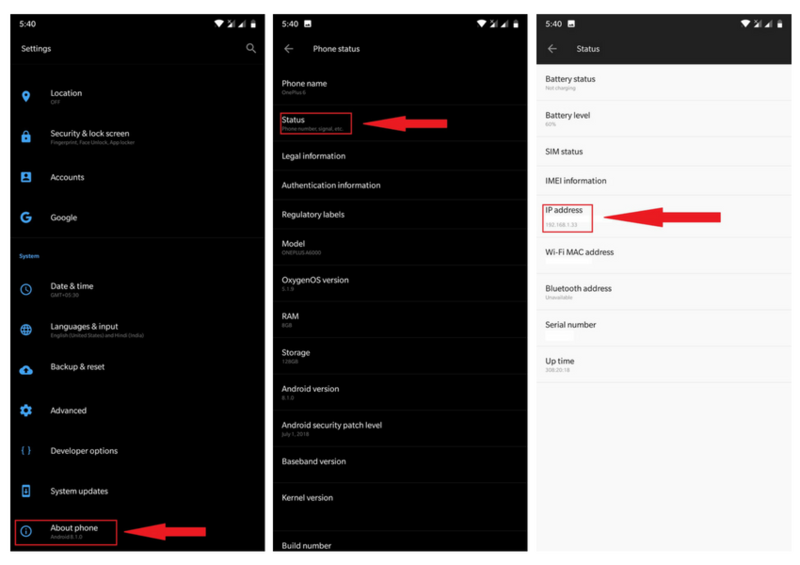 Open up your Android device’s Settings. Scroll to the bottom of the Settings menu and tap on About phone. 2. From the next menu, tap on Status. From the opened menu, you can see your Private IP Address along with Wi-FI MAC Address and other information. This method works only in case your device is connected to a Wi-Fi network. 1. 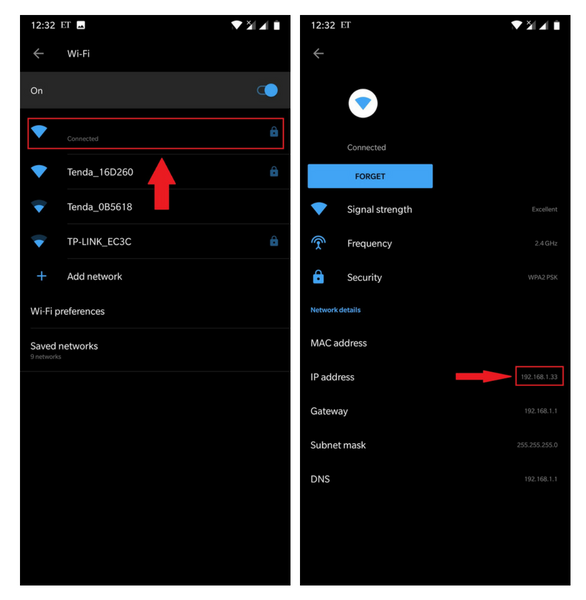 Launch Settings and tap on Wi-Fi. 2. 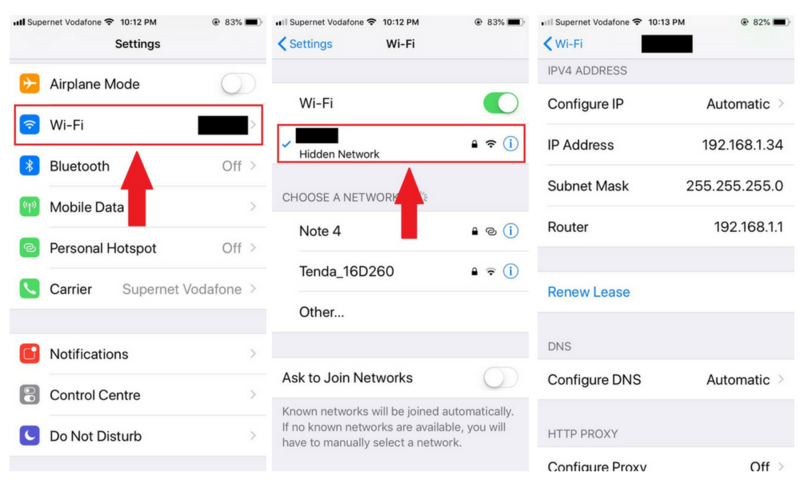 Tap on the Wi-Fi network which you are connected to and this will reveal your private IP Address and other Wi-Fi network details. 2. How To Find The Private IP Address Of My iPhone? 1. Jump into your iPhone’s Settings. Tap on Wi-Fi. 2. Tap on the Wi-Fi network to which your device is connected. Scroll down a bit and you shall find your iPhone’s IP Address along with other details. Needless to say, the above method will work only if your iPhone is connected to a Wi-Fi network. So there you have it, folks. I guess by the time you’ve done reading this post, you already know your phone’s IP Address. But if that’s not the case and you are stuck in one of the aforementioned steps, let me know in the comments. I’ll do my best to help you out.